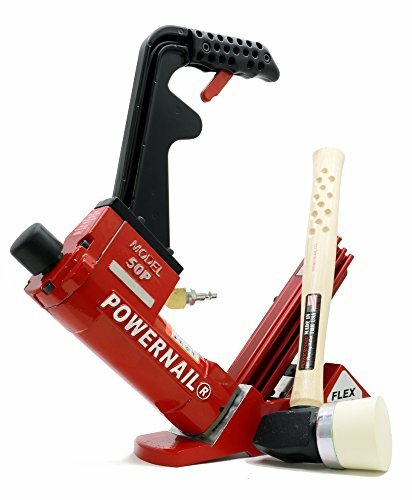 The Powernail FLEX is a pneumatic Powernailer designed for 18 gage cleats. Truly the flexible nailer , the Powernail Flex can nail down the wide variety of flooring found in today's market. Using the adjustable foot, you can fine-tune the nailer height according to different wood profiles. No need for extra shims and pads! The Powernail Flex is recommended for use on 3/8", 1/2" and 5/8" Tongue and Groove flooring as well as some 3/4" exotics, bamboo, and other solid wood flooring. The Powernail Flex uses an 18 gage cleat that is less likely to split the tongue on denser, more brittle woods. It is also recommended for flooring that is a very hard species like hickory. Many of the hard exotics available today require a thinner cleat to penetrate without splitting the tongue. The standard configuration is (L/S), Long Handle with Short Channel, which holds 100 Powercleats. Long handle configuration provides 18" height from floor to handle grip. Includes a White 3mi Mallet, 2 Allen wrenches, user manual, lube oil and an extra driving blade. Requires a 70 to 110 psi air compressor.